Our much-anticipated custom steel XC racing hardtails from Mike Ahrens are in. In fact, mine is built and I have ridden over 300 miles on it already! 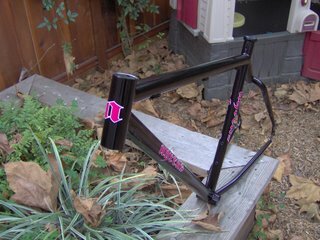 This is my initial review of my custom Ahrens hardtail. I will do another review after riding and racing it for 6 months. First of all, lets start with the looks. The first time I saw the frame was in pictures that Mike sent me right after it had come out of painting. The pics looked great, although I thought the brown (rootbeer brown) I had chosen was way too dark. The frame went to clear-coat that week and after a lengthy drying process, about a week and a half, Mike called and told Emma and I the frames were ready. Pictures didn't do justice to the beauty of this frame. The brown was dark, but with a deep, almost two-tone sparkle. The color was beautiful and the workmanship was impeccable. The steel welds were clean and showed the mark of a true master. The craftsmanship can be attributed to Paul from Rock Lobster. The design was all Mike Ahrens, who spent countless hours making sure every detail of the frame was correct. When he handed me my brand new frame he also handed me a packet with drawings and pictures of every angle and view of the frame. Mike's level of detail inspired confidence and awe. The only minor detail that was a blemish on this great new toy, was on the clear-coat. Mike was using a new clear-coater and after a couple runs the coat was about 95% perfect with a few rough spots, but nothing functionally wrong. All in all, the frame was an excellent fabrication of countless hours of experience, work, and Mike's attention to detail. Looks only go so far, the real test is the ride. I built my Ahrens hardtail up with a full SRAM XO drivetrain, Juicy 7 brakes, DT Swiss 240 wheelset, Fox F80X, and Chris King headset. The total weight was around 25.2 lbs. Not exactly light for an XC racing hardtail. 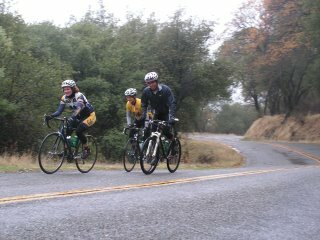 The first real ride I got to do on the bike was about 120 miles of riding on the road with slicks in the rain, in Chico. The riding was great, but having 26" wheels against road bikes sucked. Nevertheless, a few key things stuck out about my very pretty new ride (lots of comments from the roadies). Steel is real, Mike's steel is also stiff! I think people confuse this with rigid. Rigid is when a bike is not compliant and yields a harsh ride, that's not what I'm talking about. Stiff is when you get out of the saddle and all you feel is acceleration. The bottom bracket had almost no flex as I hammered up and down on the pedals. You'll know the difference if you get on a flexy aluminum bike and then hop on one of Mike's custom hardtails! This steel bike rides like carbon fiber, stiff and compliant. Descending the road on this bike was like a dream. The Fox fork tracked very well and the ride quality was confidence inspiring. I really did feel more comfortable descending this on the road than my road bike. Can it ride dirt?! I was beginning to wonder this myself after I put 8 more hours of road riding on the bike. It was just so awesome to ride, I didn't want to spend time taking off the slicks. Well, I got my answer. I took my Ahrens hardtail to some of the most technically demanding trails I know, the dirt bike trails outside of McKinnelyville in northern Humboldt county. These are rooty, rocky, muddy, and sandy trails with unforgiving slick spots that leave you wondering which way is up and how you ended up on your back. In the winter, these trails are at their best or worst, depending on how you want to look at it. I threw on a set of IRC mibros and hit the single track with Emma and my buddy Nigel. The bike exceeded my expectations. I was a bit skeptical about the Fox F80X, but it worked like a dream. I barely noticed it was there, but never had I had a bike that tracked as well as this. The combination of a stiff fork and the stiff rear end of the bike carved up slick single track like a Christmas ham! The bike cornered fast and true and I couldn't say enough about the handling. It was quick but not twitchy. My last hardtail had a 100mm fork and more of a laid back position, but I would drop myself on that bike in an instant on this one. The ride was almost indescribable and it was very surreal. When it was all over, I lamented on the feeling of railing each turn with so much confidence and control. I was able to ride sections of that trail faster then I ever had and I'm barely used to this bike. My Ahrens hardtail could climb too. Its stiff feel edged it on even on the toughest and roughest of climbs. The weight was hardly noticeable as I glided to the summit of my climbs. 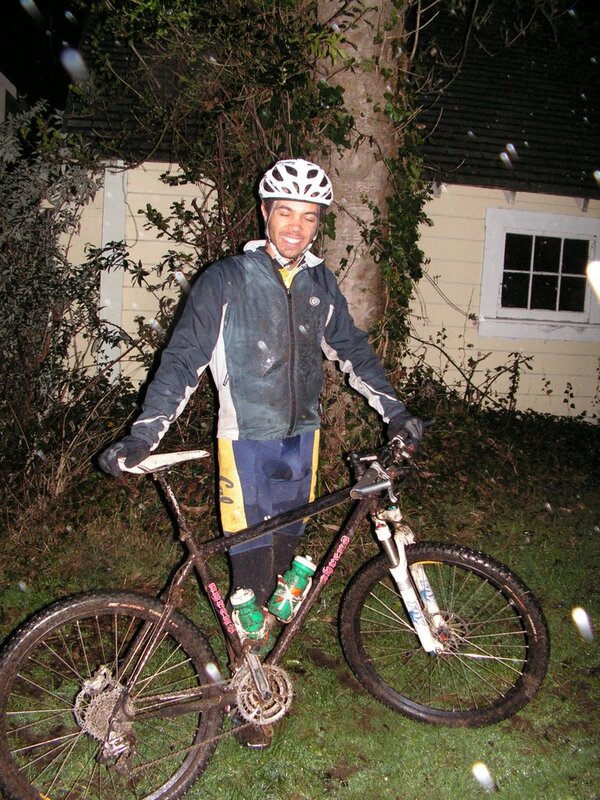 This ride was the most fun I had ever had in the mud on a rainy day! While thinking of this review, I really tried to be as critical as possible, by Mike's request, but there were only two issues I had. One, the clear-coater (not Mike's fault) should be better being that this frame's retail value is around $1400 and two, the issue of weight. At 4.2 pounds for a frame this is not lightweight. 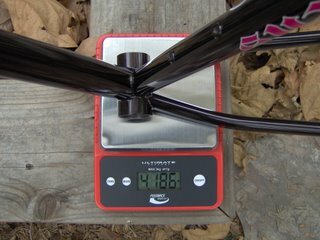 I know with a Columbus S3 tubeset, Mike can make a sub 4 pound frame. Although, if spec'ed differently, I'm sure total weights in the 23 pound range are possible for this frame. Really, if you think about it, 4.2 lbs is considered super light for a dual suspension, and I think you would be hard pressed to find a dually XC racer that is as stiff as, or that handles as well as, this hardtail. All in all, I'm a weight weenie and I'm bummed the bike is over 24 pounds, but after the rides I have had on it, I'll take weight, stiffness, and ride quality over light, flexy, and snapped chainstay of my last aluminum hardtail that will remain nameless, any day. PS. Look out for Emma's review of her new VK-Ahrens hardtail as soon as we get it built and get some miles on it.